Modern country house on the degree of comfort approaching the city apartments. They use the same life support systems, which primarily include electricity, water and sewage. The device of the septic tank refers to the primary tasks in the construction of residential buildings outside the city, where there is no possibility to connect to centralized communication systems. For suburban and country houses are mainly used four types of septic tanks: industrial manufacturing, multi-chamber septic tanks of concrete rings, two-piece chamber without pumping and septic tanks made of old tires. Sump with pumping, so popular a couple of decades, almost not used, for obvious reasons: inconvenience, unsanitary conditions, unpleasant smell. Each type can have different design features and dimensions, depending on the specific conditions and needs of your family in the first place, from what the daily volume of all wastewater, including residential building and technical facilities. But if you want to make a septic tank at the cottage with his own hands, you have to eliminate septic tanks and industrial manufacturing to stay at the three remaining types. To select the appropriate type of septic tank, need to know principle that operates this sewage system. Regardless of the design, it should consist of multiple cameras. Sewage directly from toilets and kitchens into the clarifier, which is the first camera. It depends on the type of septic tank, effluents undergo primary treatment – filtered and biodegradable or decompose. The decomposition is ensured by the presence in the sump of anaerobic microorganisms, as a result of their actions of organic matter is converted into the insoluble residue, the clarified water and gas that is removed from the chamber of the septic tank through the sewer pipe. The formed water is poured through a special opening into the second chamber and filtration a well. Unlike the settler, it is not sealed on its walls has perforated holes and at the bottom is a filter from a thick layer of gravel. Through this cushion, the thickness of which is 0.5-1 m, the clarified water seeps into the ground. Septic tanks, thus, completely decompose organic waste into environmentally friendly components and do not harm the environment. Design a multi-chamber septic tank of concrete rings is quite simple, it is easy to do yourself, so this type of sewer system used in the villas often. 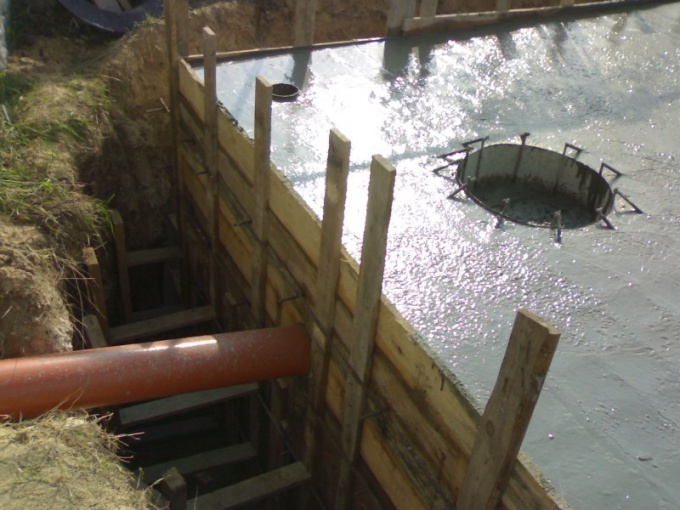 In this case, for the construction of the sump and the filter chamber (there may be two) are used precast concrete rings of standard size are the same as for the construction of wells. To select the size of the rings depends on the performance of a septic tank, perform a calculation taking into account the daily amount of wastewater. When laying sewer pipes don't forget to provide the necessary angle of inclination for each meter of the pipe is 2 cm vertically. Dig a hole sufficient to fit both cameras. Under the first chamber, which will serve as the sump, the bottom zabetonirovana at the bottom of the second to make the gravel pad. In the sump seal joints between rings and between the bottom ring and concrete base. Between the cameras, standing nearby, do the overflow hole, if they are located at a distance from each other – you have to mount a sewer pipe under a slope from the sump to the filtration chamber. The top cover of the camera a concrete slab, which should be hatches located above the chambers and closed the lids. Above the chamber sump, output the chimney height of 2-2,5 m. How to make a septic tank near his country home - you can watch online on numerous videos posted on the Internet and read reviews on the forums. For the construction of such septic tank will need a crane, but if the number of sinks is small, you can do without concrete rings, making the cameras independently, and drove them wall of concrete. Dig a pit for the septic tank, install the formwork with drainage holes for water outlet. Between the walls of the excavation and formwork install iron reinforcing rods and pour concrete with chipped stones for strength. Make a well in the chamber wall with the overflow and into the sump pour bacterial cultures are sold in packets. Usually monthly or every month and a half in the sump, you need to add a new batch of bacteria. To do this, simply pour them down the toilet installed in the house. Another option is to use as cameras specially made barrels, with inside and outside corrosion protection. But the cost would be quite large, so the septic tank can be built out of old tires from heavy trucks, the walls of which will provide the necessary resistance to aggressive chemical attack raw organic. Note that all the joints between the tires must have a reliable sealing, as well as the junction between the lower lid and concrete base, which will be installed in the sump.